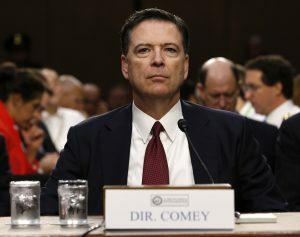 WASHINGTON — Former FBI Director James Comey scorned the memo that was released by House Republicans after being declassified Friday by President Donald Trump, saying it doesn’t add up to much. “That’s it?” Comey said on Twitter. The tweet was the latest in a series from Comey this week as Trump clashed with the FBI over the release of the GOP-written memo. He also authorized a close friend to share with reporters details from a memo he produced documenting one such encounter — a February conversation in the Oval Office in which he said Trump encouraged him to drop an FBI investigation into former national security adviser Michael Flynn. That revelation promoted the Justice Department’s appointment of a special counsel to run the Russia investigation. Will releasing the Nunes memo come with long-term consequences?